Welcome to Family First Health Center! It is my pleasure to serve as your family physician. You have a choice in selecting where you receive your primary care and we are happy you have chosen Family First Health Center as your medical home. Being a physician is truly an honor and one that I view as my life’s calling. It is a privilege for me to form a strong connection with my patients, empowering them to look and feel their best from the inside out. My mission is to advocate for the “sacredness” of the patient-physician relationship, as a key to providing quality health services. This means that you and your family can expect unhurried quality services, time for me and my team to get to know you so we can help you achieve your highest level of health. Providing high quality comprehensive medical care and focusing on the value of patient-physician relationship are essential reasons for shifting to the Direct Primary Care model. The Free Report will help you to slow, stop or even turn back the clock on your physical body with just a few simple steps. You can literally change the quality of your life going forward by taking these actions starting today! I look forward to providing on-going, continued care for you and your loved ones for years to come. Dr. Delicia Haynes has been recognized as a “trail blazer” in revolutionizing America’s Healthcare system with the Direct Primary Care movement— a model that provides a range of services for an affordable flat monthly rate. She is on a mission to advocate for the “sacredness” of the doctor-patient relationship, helping patients and physicians redesign their relationship from a place of true service. 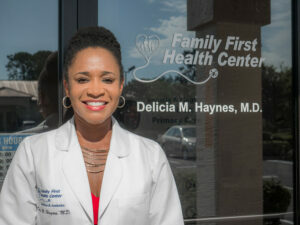 Dr. Haynes is the CEO and Founder of Family First Health Center, an integrative membership-based family medicine clinic with a worldwide reach based in Daytona Beach, Florida. 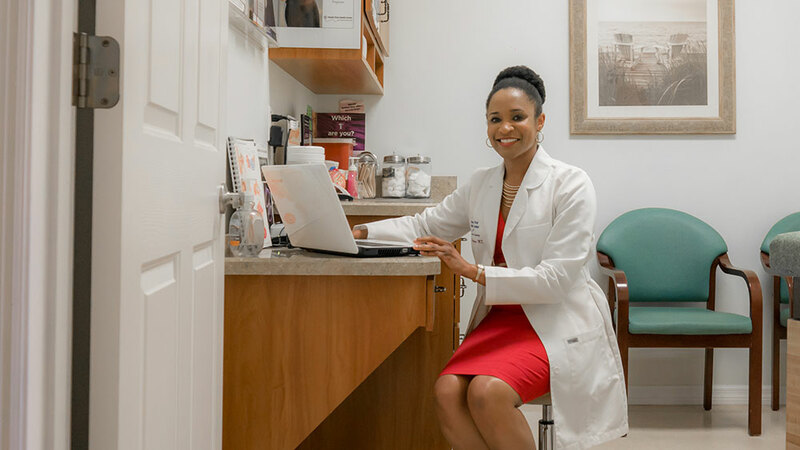 Through the Direct Primary Care model, she empowers her patients to look and feel their best from the inside out with a lifestyle medicine approach. Her commitment to helping people understand that “true medicine comes in more than pill form” has enabled several of her patients to shed excess weight, safely stop medications including insulin, become clinically non-diabetic, and live an energetic life they love. She enjoys serving a diverse patient base, including Olympic athletes, CEOs, best-selling authors, weekend warriors, top employees, teens and domestic engineers. She compassionately helps them improve their physical and mental health so they can show up fully in their personal and professional lives. She is a diplomat of the American Board of Family Medicine, the American Board of Obesity Medicine, is highly trained in medical aesthetics, laser therapy, and lifestyle medicine. She completed her specialty training at the Halifax Center for Family and Sports Medicine Residency Program. Dr. Haynes attended medical school at the University of Kentucky College of Medicine and earned a Bachelor of Arts in Biology with a minor in Spanish from the University of Louisville. Dr. Haynes is also an award-winning coach and business mentor. She created Premier Physician Consulting, which helps doctors transition to direct care practices so they can express the “art and heart” of medicine while increasing their inspiration, income and impact. If you have a question regarding your medical care, please call our office. In light of the two recent suicides of two beautiful young women – both survived a mass shooting. Of 691 surveyed, about 42 percent experienced..
3 Steps to go from Fear to Fierce in Sharing Your Story! 1898 South Clyde Morris Blvd, St. 360, Daytona Beach, Florida | (386)492-1064.